Last week, we had the privilege of enjoying the company of and serving alongside our dear friends, the Messicks. This is the Messicks second trip to Zambia. They came this August because students are off for break all month and they wanted to come invest in our kids in the Arise Home as well as the several children they sponsor through community schools, and serve wherever else was needed. After a weekend of trying to get over missed flights and jet lag, we sent them on a trip to the zoo with all their sponsored children! Our driver, Abraham, Chris, the child sponsorship officer for most of their kids, and Solomon, one of our child sponsorship directors, accompanied them. It’s crazy how close they let you get to the animals with very little protection inbetween! 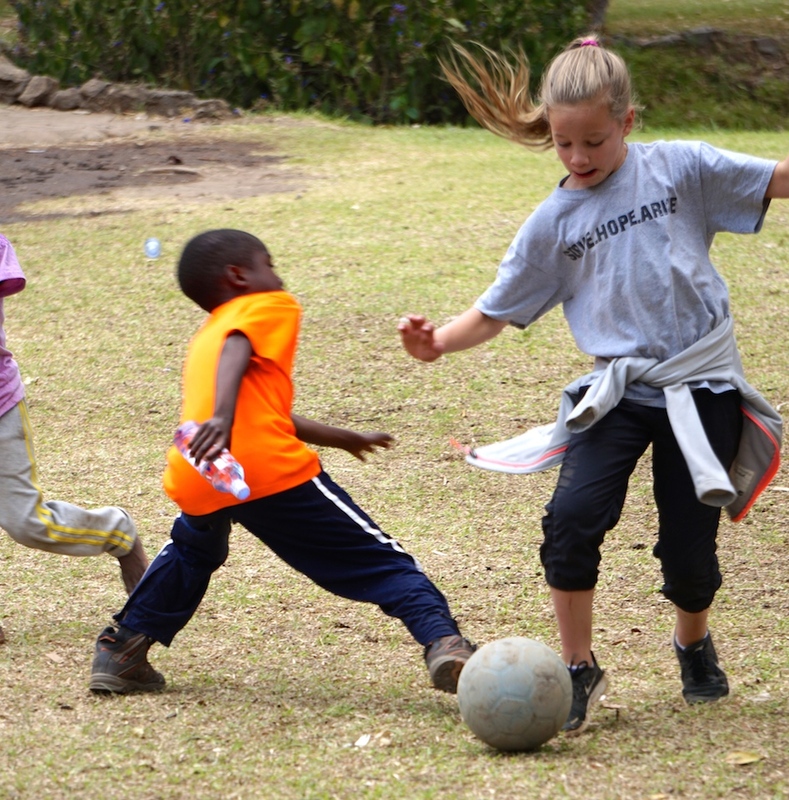 After seeing all the animals, the kids had a great time playing soccer together. Here's Chloe Messick playing soccer with the kids. It's so cool when sponsors get the chance to invest in their sponsored kids, experience their personalities, have conversations with them, and make memories with them! Here is Meredith with two of her girls. Two years ago when the Messick's were here for the first time, they had the chance to meet one of the child's (Elita) grandmothers. They walked to her house in Matero compound to meet her. When they showed up there was a feast waiting for them! The grandmother had heard Elita's sponsors were in town and she wanted to do everything she could to serve them and love them well. What was intended to be a quick visit turned into several hours. The Messicks fell in love with Elita's family and has cherished that time ever since. Back in Zambia for a second time they made it a priority to visit Elita and her grandma again. Elita was able to enjoy the zoo with everyone on Monday. To visit the grandma, they went back into Matero prepared and eager for a longer visit this time around. When they showed up, (surprise!) the WHOLE family was there, plus a few. Here is Meredith and Chloe with Elita’s grandmother. When they returned to the complex, we had the Arise Home kids over to help us with a work day. Drew, Ryan, and Alissa had a great time burning trash. Planting grass is a tedious task in Zambia, but with the help the Arise Home boys, Andrew (our housekeeper's son), Kochelani and Sammy Joe, we got it done! Meredith, myself (Morgan), and the Arise Home girls working hard to sort all our donations so that we can pass out clothes and shoes to kids who need them in our community schools. It was a great day of working side by side with people and getting to know each other better. At the end of our day, Asher offered rides on his dirt bike. We persuaded our sweet housekeeper, Susan, to give it a try! Everyone loved it, even Susan! Here's Kochelani and Susan after their ride around the complex. On Wednesday, we headed over to the house in Ngombe, which will serve as our temporary Arise Christian School until we begin building on the property in January. The house desperately needed a fresh coat of paint. With the help of the Arise Home boys, Hope, and our country director, Monica, we painted every room. Everything is coming together and I am getting more excited to welcome kids in on September 5th. Here's Hope, Chloe, and Asher outside the house. We celebrated a job well done with lunch at Mint Lounge. Left to right is Hope, Chloe, Mukonda, Fred, Shadrick, Armon, and Drew. After a week of working hard, we decided to play paintball with the Arise Home kids! Then we had them over to the complex for a day of fun! We rode bikes. Here's Daniel, Muyunda, and Lovemore. Lovemore and Muyunda are still in need of sponsors. If you would like to join us in providing these boys with a loving home, a good education, and discipleship, you can sponsor them at $50 or more here. We played basketball. Here's brothers, Fred and Mukonda. We played with balloons. Daniel, Lovemore, and Muyunda are the best of buds. We learned about Madlibs. Here's Hope, Chloe, Alliness, and Nelly. We ended the night with a devotion led by Meredith and a movie in the courtyard. The kids stayed the night and were treated to hot cocoa and breakfast in the morning. Successful sleepover at the complex! It was a great end to a full week of serving and building relationships! Thank you, Messick family! Looking forward to seeing you soon!